What is GNC Women's Ultra Mega Menopause? GNC Women's Ultra Mega Menopause is a Vitapak® Program that helps women find relief from common menopause symptoms – night sweats and hot flashes – as well as supports heart and bone health. In addition to supplements for menopause, this product provides women with multivitamins as well. 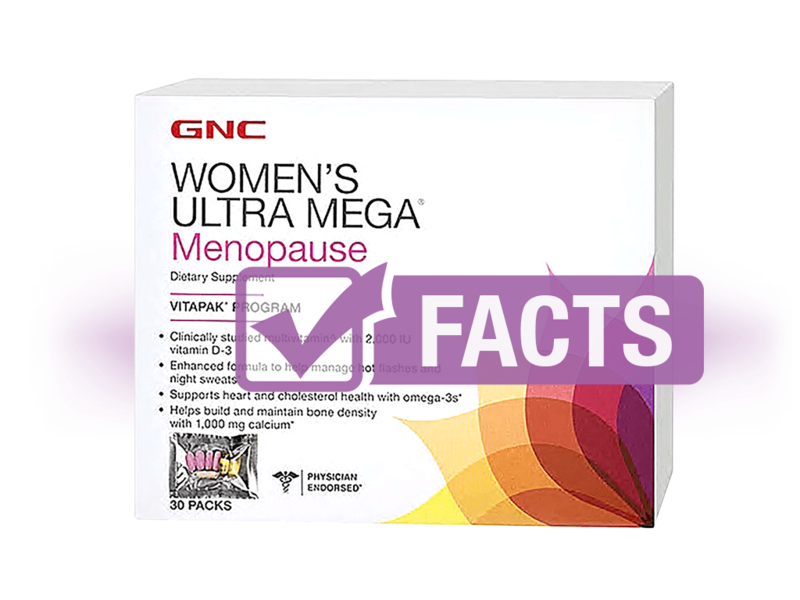 GNC Women's Ultra Mega Menopause contains seven (7) daily pills to take, each of which was designed to support a woman's overall health. For example, the Women's Ultra Mega Bone Density formula includes key vitamins and minerals beneficial for bone health and natural bone building. It is also enhanced with cell-protecting antioxidant nutrients involved in the formation of the bone matrix. Vitamin C - required for the absorption of iron, wound healing, a healthy immune system, etc. This product does not contain gluten, yeast, artificial colors, or artificial flavors. Check with a doctor before use if you are taking medication or have a medical condition. This supplement is not recommended for women who are pregnant, nursing, or may become pregnant. You may have to discontinue use of this product two weeks prior to surgery. GNC does not mention any short- or long-term side effects from taking any of the pills in this menopause supplement pack. However, our external research reveals that high doses of black cohosh can cause headaches, lightheadedness, uterine contractions, joint pain, slowed heart rate, lower blood pressure, and more. Black cohosh is not recommended for use more than six months at a time. Positive reviews talk about the product's ability to relieve hot flashes, fatigue, irritability, night sweats, insomnia, and more symptoms. Negative reviews complain about the product not being derived from food as well as its apparent ineffectiveness in treating symptoms. Positive reviews rave about finding relief from hot flashes, nights sweats, joint pain, fatigue, anxiety, mood swings, and more. Negative reviews mention the supplement's ineffectiveness, how inconvenient it is to take seven pills a day, the apparent smell of the supplements, and the addition of artificial sweeteners, such as sucralose. As a dietary supplement, take the contents of one pack every day with food. Store in a cool, dry place. 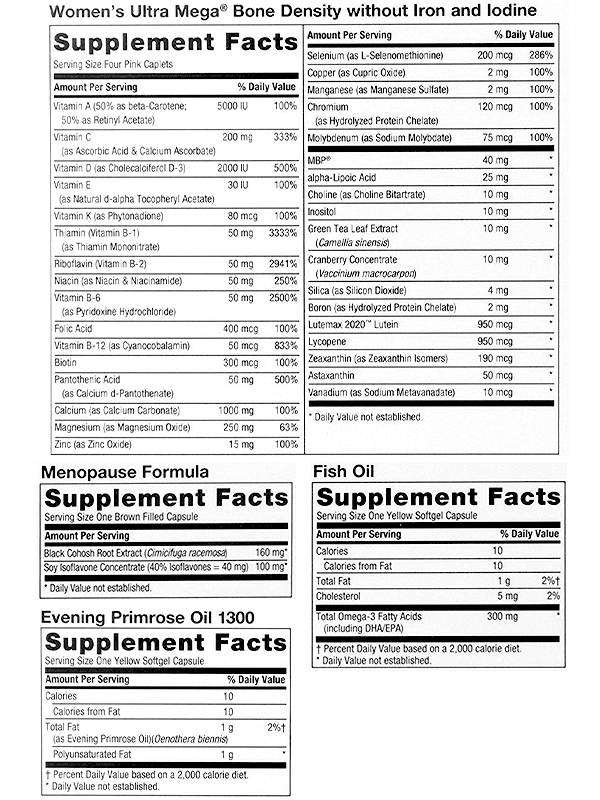 GNC Women's Ultra Mega Menopause is available for purchase through GNC's official website (www.gnc.com) as well as on Amazon. It may also be available in GNC stores nationwide. GNC Women's Ultra Mega® Menopause is a registered trademark.